Patrol 52 under Rolf Struckmeier 8 days November 6-15 1942. Kapitänleutnant Rolf Struckmeier brought his command U-608 into the New England area from east to west then west to east for 8 days total between the 6th and 15thof November, 1942. At first U-608 headed in a straight line west from a point about 250 miles south of Cape Sable Nova Scotia. The sub exited the region about 200 miles south of Montauk, New York on the 8th of November. On the night of the 10thand 11th of November U-608 laid a mine field off New York Harbor: ten TMA-type mines, These lethal weapons however never found their mark (Wynn, Vol. 1, p. 77). According to UBoat.net the field was laid near Ambrose Lightship and was detected and removed before any ships were damaged or sunk. Three days later Struckmeier headed back from the New York region, going east to a point well south of Nantucket, then northeast to the entrance to the Gulf of Maine on the 13th, and finally southeast and east on the 14th and 15th, to exit about 100 miles south of Cape Sable NS. The day after leaving the region, when east of Halifax, U-608 caught the 5,621-ton Irish steamer Irish Pine and sank here with one torpedo. It was a devastating attack and there were no survivors of the 33 Irishmen working the ship. On the 27th of November U-608 exhausted its fuel supply and was adrift until U-521 then the milk cow U-460 rendezvoused with her an replenished the fuel northwest of the Azores. This patrol began in St. Nazaire France and ended there 51 days later on the 9th of December, 1942. 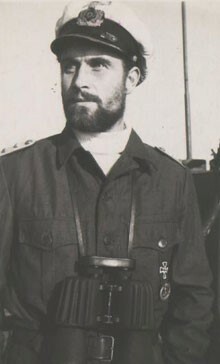 Rolf Struckmeier was born in July 1916 and according to Uboat.net not only survived the war but is possibly still alive. He was a member of the Crew of 1935, following which he was range finder on the Admiral Hipper to April 1940. He then joined the 1st Torpedo Boat Flotilla until October of that year, and joined U-boats thereafter. Struckmeier served as 1stWatch Officer on U-205 for three patrols including penetrating the Mediterranean Sea at Gibraltar. He took command of U-608 in February 1942 until January 1944. He served as a training officer from January 1944 until the surrender (Uboat.net, Busch & Roll). Overall Struckmeier sank four ships for 35,539 tons and a warship being carried aboard one of those merchant ships, of 291 tons. He was awarded the German Cross in Gold, U-Boat Front Clasp and War Merit Cross 2nd Class with Swords.